Russia’s commercial air industry is to be revitalised by the introduction of new reforms intended to facilitate the development of a market for low-cost airlines. Economy flights would promise lower fares but introduce extra costs for food and baggage. The Ministry of Transport has announced plans to begin work on establishing the necessary conditions for the development of a new low-cost airline segment in Russia.However, although such airlines will help reduce travel costs, passengers should not expect fares to be comparable to those in Europe – the maximum discount available will be 35 percent. The Ministry of Transport has prepared a number of measures to develop the low-cost segment. Firstly, it has drafted an order to abolish mandatory in-flight food on Russian planes. In addition, the agency has proposed the introduction of non-refundable tariffs, as well as excluding the cost of luggage transportation from the ticket price. Experts say that under the current system, the airlines have to allow for potential losses from ticket refunds, which increases their total costs. According to management consulting firm A.T. Kearney, discount operators account for about 40 percent of domestic traffic in Europe. In Russia, however, the total portion of low-fare traffic is no more than 20 percent. This includes special fares offered by Russian airlines as well as two Western low-cost carriers – German Wings and Air Berlin. There are no Russian discount operators in the market at present, meaning the domestic market represents a promising niche for local airlines. The development of the low-cost segment in the Russian Federation should also be promoted by the recent decision by the Eurasian Economic Commission (EEC) to allow Russian airlines to buy various modifications of the Boeing 737 and Airbus A320. These models are the most economically advantageous aircraft for budget operators thanks to their capacity – 170-219 seats. According to experts, non-refundable fares alone will reduce costs by 20 percent. Overall, prices may be reduced by 35 percent, stimulating demand and allowing Russian low-cost airlines to attract new customers, and at the same time, to score a victory in the competition against their main transportation competitors – the railway companies. As air industry experts explain, low-cost airlines are long overdue on the Russian market. The incomes of Russians are gradually rising – in 2013 alone, they rose by 3.3 percent, according to state statistics service Rosstat. As for the average monthly salary, it increased by 12.3 percent – up to 29,940 rubles ($820). This leaves the population with greater disposable income to be spent on luxuries such as travel. A substantial client base for discount operators already exists. “Individual tourists, mostly young people – so-called backpackers, will travel with low-cost airlines,” says Vladimir Kantorovich, president of the Association of Russian Tour Operators (ARTO). It is the new budget airline – Dobrolyot, an affiliate of the state carrier Aeroflot – that will meet much of the demand for low-cost flights on the Russian market. Dobrolyot plans to launch its first flight from Moscow to St. Petersburg in the summer of 2014, then gradually add another ten destinations across Russia. As for access to international flights, according to Oleg Panteleyev, the demand for transportation to and from Russia is growing among both Russian citizens and foreigners. “However, it will only be possible to predict the success of Russian low-cost airlines in conquering international skies based on the results of their operations on domestic routes,” says Panteleyev. According to the existing rules, any Russian airline established from scratch must operate exclusively in the domestic market for the first two years. At the same time, the special conditions being established by the Ministry of Transport cannot solve all the challenges facing potential operators. For example, Kantorovich points out that Russian airport charges are significantly higher than those borne in Europe by economy airlines. 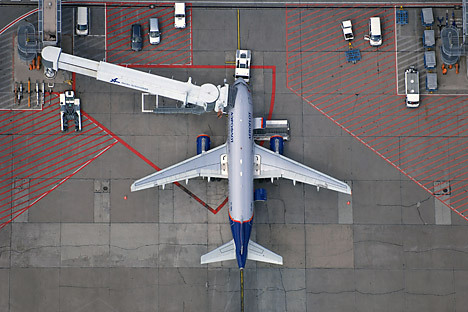 However, there is already a plan to create a dedicated airport for low-cost carriers in Yermolino, near Moscow. Another obstacle in the path of Russian low-cost airlines is the lack of developed interregional aviation: Almost 80 percent of air transportation in Russia is currently not direct but routed via Moscow airports, with their high rates. In order to create a niche for low-cost airlines in the domestic market, it will be necessary not only to make changes to legislation, but also to develop the country’s route network.